Application – Why, of all people, should Jacob have known not to favor one child over the other? (Because his own father favored Esau over himself. He knew the pain of rejection. He does not learn though and favors Joseph and makes it abundantly clear to the other members of the family.) Why do you think God gives the dreams to Joseph at this time? (Because He wants Joseph to know the future plans he has for Joseph. Later this will be an encouragement to Joseph as he faces the severe trials ahead. God’s promises strengthen us when we undergo difficulty. Also, his brothers and father need to know so they will recognize God’s hand in the future when they actually do bow down to Joseph! All will recognize that God is in control.) Even though Reuben saved Joseph’s life, he still shares the guilt of what the brothers have done. The fact that he wasn’t there when they sold Joseph, doesn’t absolve his guilt. Why? Did he participate in the cover-up? (He had the power to let Joseph go earlier and didn’t; and yes, he participated in the cover-up.) This is a great time to point out to your children standing by when a sinful act is done by others, doesn’t mean you are innocent. What should have Reuben done? (First, as the oldest could have stopped the whole thing. He should have kept the brothers from doing anything thing to Joseph and when they did, he should have told the truth to his father.) When we witness wrong and do nothing to make it right, we share in the guilt. Ask your children for examples of this (examples: they see a friend steal something from a store but don’t require them to take it back or report it; their siblings do something sinful and they don’t admonish them or go with them to confess to the parent, they see their friends making sinful choices and they do nothing.) However, it is also important to realize that in all of this with God is working. However, Reuben and his brothers still stand before God for the wrong they have done! 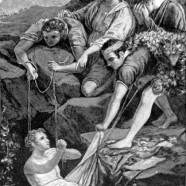 How did the sin of envy progress in the hearts of Joseph’s brothers? Do you struggle with envy? Tell about what led you there. What can you learn from this story? How can you deal with this problem? What does God want from you? Be specific and list Bible verses.